Our national parks offer incredible scenery, well-marked trails & great park rangers. Ergo you’re less likely to get lost and left for dead while exploring. The bad news; others have discovered this! Want to avoid the crowds & get a little solitude! Go in the offseason. I just returned from Arches, Canyonlands & Capital Reef. Had the parks to myself. BAM. Cold? Nope! I was mountain biking in a tee shirt last week (55 degrees)! Typically you see bluebird days with highs in the upper 30s. Enough talk, let’s fire up some pics. The Delicate Arch pictured below (Inside Arches Nat Park/absent the usual mob scene). Having some snow on the ground improves the photog! Snow or not, Arches National Park has lots of great stuff waiting to be explored. How about the Mobius Arch viewed thru the South Window? Pic gallery from my recent trip! Wondering where all this stuff is? Wondering where I’m going next? Having spent several days at Arches Nat Park I’m about to head over to Canyonlands. By the way, I’m staying in nearby Moab (close to both parks). Eventually, I’ll be exploring Goblin Valley and then on to Capital Reef Nat Park. First stop at Canyonlands: the iconic Mesa Arch. The scene at sunrise is typically Viet Nam. 40 photographers fighting for position (in a space that holds 8). Not in the winter! Want to get a feel for how the sun actually rises to light the underside of the Arch? Timelapse to the rescue! 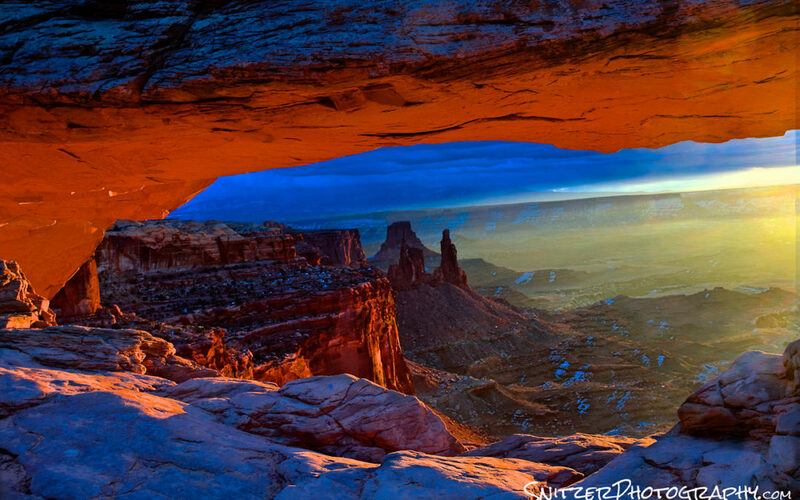 Two vacationing park rangers from Zion National Park and I share the sunrise over Dead Horse Point (Canyonlands). No one else in sight! The lingering snow from an earlier storm really kicks ars. Improves the image! I know you want more time-lapse. I’m on it! Or how about the seldom viewed False Kiva, said to be an ancient meeting place of the Anasazi Indians. This baby is cut into the side of a massive cliff. The access route is unmarked (hint…GPS directions avail on Google). Here’s the view if you’re dumb enough to stick around at night. I shot this with a full moon providing backlighting and a gelled flashlight to create some color inside. I know, I’m a genius. Speaking of genius, luckily I didn’t get killed doing the 45 min climb out after dark. Brilliant. No dumbass. I didn’t forget the time-lapse. Green River Overlook BABY! There’s T Snitz Esq. pondering the meaning of life as I look out over the great divide. I should have been a philosophy major. Moving along 15 mins South to Grandview Point! Ahhhh…I can just feel the stress melting away. Who needs to meditate up here. Goblin Valley houses some stuff from a science fiction movie. Seriously, Galaxy Quest was filmed there. Next stop, the East boundary of Capital Reef National Park. Wow. This place looks like the moon. Ok, you planning your winter trip to Utah? Seriously! What are you waiting for? You’re not getting any younger! Want more pics before you commit? Check out the images I took last week (click here)! Still hungry! Ok…more of my stuff from Utah(click here).